After 10 long days of not being able to hold Kate (I was in Chicago for 5), I, we, finally got to hold our precious little girl. She's pretty groggy from all the drugs she has taken and she quickly fell asleep in my arms. After a couple of days with good stats, doc decided to let her try on her own. 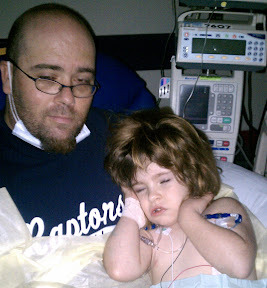 As I mentioned last night, she was doing most of the work; the ventilator was only doing 6 breaths per minute. Her sats (oxygen saturation levels) have remained strong, but after a few visits from friends and family, and probably sheer exhaustion, they began to hover in the low 90's range only occasionally dipping below 90 (that's typically when the alarm goes off). You can probably see a bit of it in the picture, she still has an oxygen mask, but it's a blow-by and doesn't need to be on her face (which she objects to, vigorously). She may still need the nose plug-in variety for delivering oxygen, but she just hasn't needed it yet. Naturally all this is great news. The support we have received from all over the world (love the interwebs) has been amazing. Thank you all so much. Chet, sorry that Kate had to go through all of this. I feel for you man. I have two young kids and I know how it feels to have a sick child. Glad she's getting better. Glad to hear things are on the upside. Having two girls myself, I known you wish you could switch places with them in such a moment!. MUAH, MUAH, MUAH! Kisses to all of you and especially all over the Katsters face!